LNK files are used by malware for many years so there is not much new about it that can be said with regards to persistence. The following examples explore 2 more (but less popular) methods of leveraging LNK files as a persistence mechanism. The first one relies on Hot Keys. 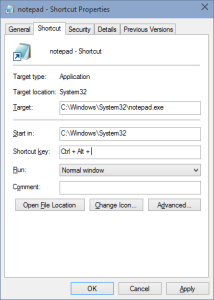 LNK files placed on a Desktop or in a Start Menu have an interesting property – they can register hot keys that may activate the respective lnk file i.e. launch them. This was handy back in a day when icons on a desktop were hidden most of the time and using shortcuts allowed accessing the most popular applications w/o a need to minimize all windows, or browsing through the Start Menu. Today, the new Taskbar in Win7/8/10 + Windows+<number> combinations make this functionality pretty much obsolete. But it’s still there. 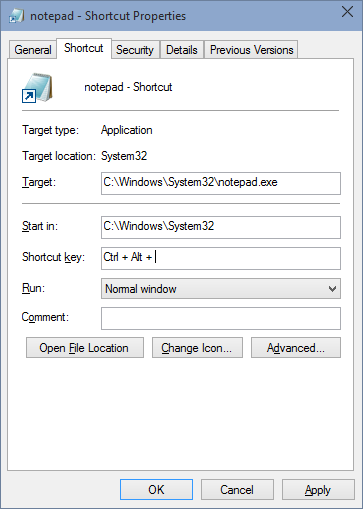 And one can modify an existing Desktop/Start Menu shortcut, or create a new one that will point to a malware. It will be activated anytime a specific combination of keys is hit. One could bypass this restriction by setting the keys directly via COM object responsible for creation of shortcuts (IShellLink interface), or even manually modifying the .lnk file (on a binary level). To demonstrate this trivial trick we can look at the following snippet of code. It leverages a COM IShellLink interface accessed via Visual Basic Script to create a shortcut to a c:\test\malware.exe file. The ‘malware’ will be activated anytime someone presses a CAPS LOCK. A trivia fact: ‘Captial’ is actually how VBS refers to a CAPS LOCK key. This choice of key(s) is actually not that bad – people don’t use CAPS LOCK at all and at the same time – they often press it accidentally every once in a while. After some more tests it also looks that it does NOT affect running programs, so f.ex. 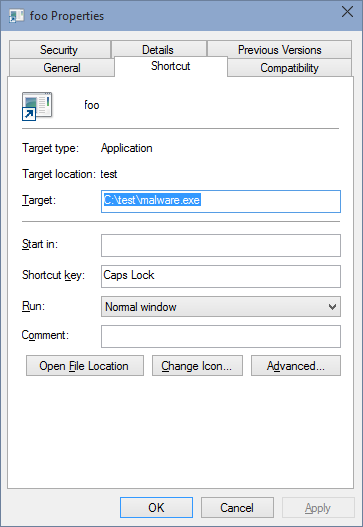 if you type something, then press CAPS LOCK (malware runs), applications will still interpret CAPS LOCK and switch to capital letters. Pressing it again brings the small letters back (while malware executes again). A kinda similar concept applies to F1 which could be used as an alternative (people don’t use a built-in Help that often either). 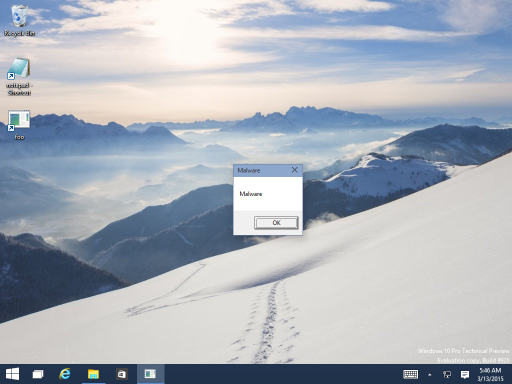 The c:\test\malware.exe is a simple program showing a message box. The other way one can exploit the .LNK files is by modifying not the path to the executable itself, but by changing the command line arguments. This is in fact a technique that is actively used by malicious plugins. They use this trick to patch .LNK files pointing the Google Chrome browser to load a malicious plugin via a modified command line. The command line switch that is added is ‘–load-extension’. Chrome uses a lot of command line arguments that could be potentially abused the same way.